Pentek, Ametek & American Plumber Replacement Membranes Elements | Applied Membranes Inc.
AMI Pentek Ametek replacement elements are specially designed for direct replacement into existing Ametek, Pentek, US Filter, or American Plumber RO Systems. AMI membrane elements are among the finest in the industry. 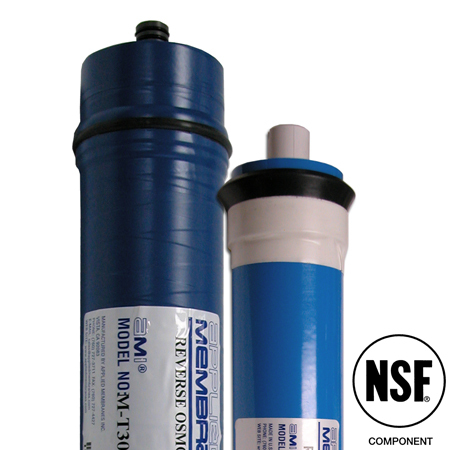 These tap water thin film reverse osmosis membranes are available in residential and commercial sizes. With hundreds of thousands of membranes in operation world-wide, we have earned a reputation of delivering consistent, high quality which makes AMI replacement membranes an excellent choice for use in home or office RO systems. Model M-T1812A24 is certified to NSF/ANSI 58 for the reduction of Arsenic, Barium, Cadmium, Chromium (Hexavalent), Chromium (Trivalent), Copper, Cysts, Turbidity, Fluoride, Lead, Radium 226/228, Selenium, and TDS. Reverse Osmosis removes up to 98% of total dissolved solids. AMI RO membranes deliver healthier and safer drinking water by reducing concentrations of Arsenic, Barium, Cadmium, Chromium (Hexavalent), Chromium (Trivalent), Copper, Cysts, Turbidity, Fluoride, Lead, Radium 226/228, Selenium, and TDS. Works as a direct replacement in existing Ametek, Pentek, US Filter, or American Plumber RO Systems (Refer to Details tab for replacement cross-reference information). * Salt rejection and performance specifications shown are from internal test data. Residential: 500 ppm feed, 50 psi applied pressure, 77ºF (25ºC) feed water temperature, pH 7-8, 50% recovery. AMETEK 10: 500 ppm feed, 60 psi applied pressure, 77ºF (25ºC) feed water temperature, 10% recovery. AMETEK 20: 500 ppm feed, 225 psi applied pressure, 77ºF (25ºC) feed water temperature, 10% recovery. Applied Membranes, Inc. supplies private label and custom membranes to OEMs all over the world for use in manufactured membrane systems. Click Here for More Information.